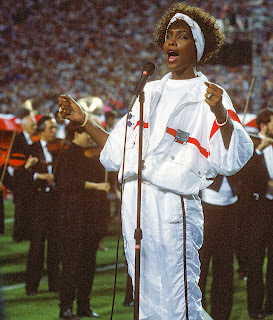 Ehkzu Artzu: Did Whitney Houston do right or do wrong when she redid the National Anthem back in 1991? Did Whitney Houston do right or do wrong when she redid the National Anthem back in 1991? "Maybe the composers would be miffed that the simple harmonic structure was changed to please a certain group of people." "The Myrtle of VENUS with BACCHUS's Vine. More verses follow in similar vein. So first we must ask what Mssrs. Smith and Tomlinson would have thought about some tax-dodging enemies of their nation transmogrifying their club's jolly drinking song into a revolutionary anthem. After that jolt I can't imagine Whitney Houston's morphs adding much injury (from their POV) to what Francis Scott Keys did during the War of 1812. Hassler's original is lovely. Bach's makes me weep (and I'm not even a Christian). Note that he rerythm'd that along with changing the harmony, as Whitney did with our anthem. There is no bright, clear line between "composer" and "interpreter." For me what matters isn't what's different but what moves me. Most National Anthem re-dos make me wince, to be honest. If you're going to mess with a nation's anthem you'd better know what you're doing. But in this case I think Whitney did. As you can see from the innumerable comments by listeners who said and say how meaningful Whitney's version was--including families of our military who were serving in the Gulf at that time. Whereas all the miserable perversions of both the anthem and Whitney's revision mostly get comments that put in words what would appear on my old German shepherd's face when I'd try to play the harmonica and he'd desperately paw at the instrument trying to get me to stop.